ETROTTE These cards were worth the cost and everyone loved receiving them. The cards are extremely bright, printing looks great! mommyinlodi these invitations are so cute, i cant wait to mail them out. 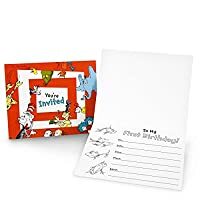 i had such a hard time finding somewhere to get these invites then i ran across this site it was so easy the people answered any questions and i got delivery early. i will definiatly use this site for all of my childrens birthdays!!!!!!! kristmac I bought these for my son's first birthday and they are adorable. Everyone loves the invites and I'm so glad I did something fun and different for his first birthday! sjSTARR I bought these for my son's first birthday and they are adorable. Everyone loves the invites and I'm so glad I did something fun and different for his first birthday! 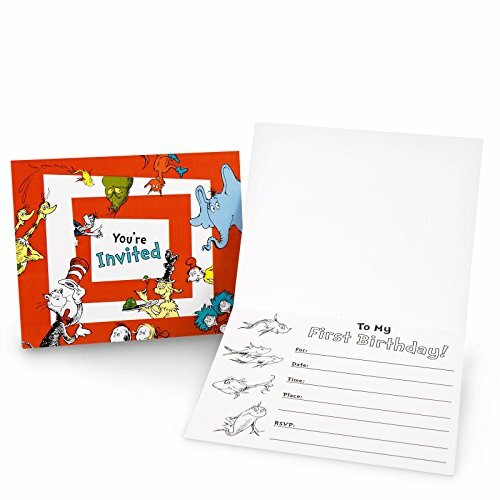 domsmom57 These invitations fit my Dr. Seuss theme perfectly! Made from thick paper, easy to write on, no smears.... Will definitely order from this site again! Canales LOVE THESE CUTE AND FUN INVITES..EVERYONE LOVES THEM AND WERE ASKING ME WHERE I GOT THEM FROM...THANKS..THEY WERE A TRUE HIT! PartyPlaning I love these invitations. Great quality of card stock. agar26 This whole theme is adorable & the products are great! My son is going to have an awesome 1st birthday!! JayJ I absolutely adore these invitations they are perfect for a babies first birthday.